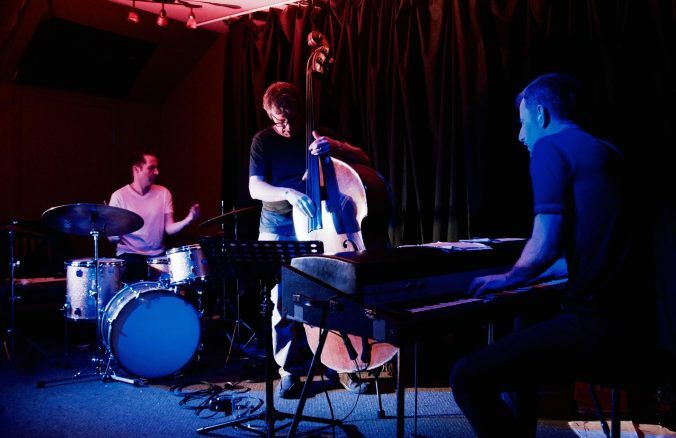 Performing at Moncton’s Plan b Lounge on Wednesday evening, the Marc Gautreau Trio, consisting of bassist Matt Babin, Rhodes keyboardist Armand Melanson and its band namesake on drums, is looking to indulge and, in some cases, introduce audiences to their love for simplistic jazz. While all genres of music are open to the listener’s interpretation, jazz seems to be one area that is especially fraught with misconceptions. People not familiar with jazz music tend to envision seemingly endless, cluttered songs that thrive on improvisation, ignoring any kind of conventional time signatures along the way. There also tends to be the perception that jazz fans are somehow elitist, seeing themselves as smugly superior to those who dare stoop to listen to pop music. Not surprisingly, none of those labels apply to Gautreau and his bandmates. By his own admission, Gautreau is a late-bloomer when it comes to jazz, having played in a number of rock bands throughout the 80’s and 90’s before being turned onto jazz around the turn of the century. Before long, Gautreau began indulging in the works of legends like Wayne Shorter, John Coltrane and others, discovering a world of music that, contrary to the notion that jazz dwelled in a world of unhinged time signatures, he readily identified with. “Albums like Wayne Shorter’s JuJu and John Coltrane’s A Love Supreme each had a vibe that was very individual and unique. I had always been attracted to really dense music, but was also a fan of space and silence in the songs as well. That was something that artists like Coltrane and Miles Davis brought to the table. There are so many records from that era that almost anybody could appreciate, whether you’re new to jazz or not,” Gautreau says. One aspect of the jazz aesthetic that Gautreau’s trio proudly carries, however, is allowing each song to have some breathing room when they perform. While they faithfully deliver renditions of various jazz standards from last century in addition to showtunes and tracks from the catalogues of some of the greatest jazz artists of all time, Gautreau insists that whether you’re a jazz novice or a seasoned expert, his group has a little something to offer everyone. When: Wednesday June 29, 9 p.m.